Stop the Senate from Gutting the Clean Air Act! Just when you thought the U.S. Senate couldn't do any less for clean energy and the environment than it's (not) done so far, we now face the real possibility of what would amount to a “stop-work order” on the 40-year-old, wildly successful (e.g., studies finding benefits outweighing costs at a 40:1 ratio), Clean Air Act. That's right: believe it or not, Sen. Jay Rockefeller (D-WV) is moving ahead with a sequel to Sen. Lisa Murkowski's nefarious attempt, earlier this summer, to gut the Environmental Protection Agency (EPA)'s power to protect the public health from dangerous pollutants, including harmful greenhouse gases. Just as bad, Rockefeller's proposal would keep America addicted to oil and other old, polluting energy technologies, while delaying or derailing our switch to a clean, prosperous energy economy. Essentially, what Rockefeller is proposing would tell the EPA – at least for two years, although we know that justice delayed is often justice denied! – that it has to be asleep at the switch, that it must not hold polluters accountable, that it must look the other way whole Big Oil and Big Coal trash the environment. Is that the lesson the Senate learned from the Gulf of Mexico disaster? Really? Fortunately, not everyone is so clueless as the U.S. Senate appears to be right now. For instance, in yesterday's Politico, two energy investors – one Democrat, one Republican – explained what's at stake in clear, compelling language. We are not experts in vote counting or horse trading. But we do know how investors and markets will respond if Congress ultimately fails to put a market-based price on carbon. The response from capital will be brutal: Money will flow to places like China, Europe and India — and U.S. jobs will go with it. The path to creating more U.S. jobs is simple: Pass legislation that eliminates uncertainty and levels the playing field, and investors will fund projects that create good jobs here at home. Rules bring certainty, certainty spurs investment, and investment creates jobs. Take it from investors: Removing the uncertainty, and taking a more thoughtful approach to energy policy by putting a market price on carbon, can bring home new investments and jobs — and ensure that America leads the clean energy economy. Instead, it now looks like the Senate not only won't be moving us forwards, but instead will be trying to move us significantly – and disastrously – backwards. What's truly stunning about this possibility is that, right now, the science of climate change is clearer and more disturbing than ever. Heat waves are getting worse, the ice caps are shrinking faster than ever, and scientists are telling us that the world is setting new temperature records almost every month, every year, and every decade. In addition, the results of our insatiable thirst for fossil fuels were demonstrated starkly and tragically, both in a West Virginia coal mine as well as in the Gulf of Mexico, on TV screens all across America in recent months. As if all this isn't bad enough, we also could run out of water. The American people know this situation can't go on. In fact, recent polls show large majorities supporting an energy bill that would “[l]imit pollution, invest in domestic energy sources and encourage companies to use and develop clean energy…by charging energy companies for carbon pollution in electricity or fuels like gas.” In other words, this is a case where good policy – limiting greenhouse gas emissions, enhancing our national security, safeguarding public health, jumpstarting a clean energy revolution – and good politics – strong poll results for doing just that – appear to align. Yet, the U.S. Senate appears ready to ignore both good policy and good politics, and actually move to make matters worse by gutting the EPA and letting polluters like BP off the hook. Don’t let them do it. Call your Senators right now and tell them “hell no” to the “Let Polluters Pollute with Impunity Act.” Also, while you’re at it, call the White House and tell President Obama that, if such a measure reaches his desk, he will veto it – no ifs, ands, or buts. Take action today for a cleaner, stronger, and more sustainable future. Join NRDC Action Fund on Facebook and Twitter and stay up-to-date on the latest environmental issues and actions you can take to help protect our planet. As Fired Up Missouri’s .Sean and the P-D’s Tony Messenger have noted, Tea Party groups around Missouri are openly critical of Roy Blunt in his bid for the GOP nomination for US Senate, and openly supportive of his rival Chuck Purgason, and have excoriated their hero Michele Bachmann for stumping in Missouri on behalf of Roy Blunt. And as Adam makes clear at St. Louis Activist Hub, the St. Louis Tea Party, despite a history of claiming that they would really go after Roy Blunt for his supposed crimes against conservatism, has taken a stance of neutrality in the primary. In some ways, this is a moot point, as far as you and I are concerned. For myself, and I assume for most readers of this blog, we’re not going to support the Republican nominee for Senate whether it’s Chuck Purgason or Roy Blunt. But I do think that it’s going to be hard for Republicans to make the case in November and beyond that they truly have fiscal principles based on limited government free from corrupting influences if they nominate people like Blunt, who helped wrangle through the an unpaid expansion of Medicare and a massive bank bailout with no strings attached, not to mention tangled tightly in a web of ties to lobbyists. In the primary, conservatives have the chance to speak up and indicate that they would prefer someone who doesn’t have that baggage. The St. Louis Tea Party apparently cherishes their close ties to the Republican establishment more than principles. We at Show Me Progress regularly criticize Democrats for either ethical failings or for taking what we view to be poor policy stances, with McCaskill absorbing the most of our ire. For my part, and I would hope for progressives around the state would agree, if a progressive challenger to McCaskill, or Nixon, or any other statewide elected Democrat should make a strong case in the Democratic primary, I wouldn’t hesitate to back them even in an uphill battle. Same goes for Robin Carnahan, but I can’t see any other candidates in her primary who I would prefer. After all, the best, and really the only, time to change the direction of your party is to speak up in the primaries. We decided a long time ago not to endorse candidates in the primary. That means we don’t un-endorse, either. The Tea Party, being totally decentralized, represents a lot of ideas and opinions. We love that. We love that so many passionate conservatives have gotten involved in the process. True, Purgason does seem to be a stand-up fringe-winger, willing to take the crazy as far as it will go, but withal showing a type of integrity – while Blunt is a surely a cynical, get-while-the-getting’s-good kind of guy. But seriously, is it possible to be so far to the right that one describes Newt Gringrich, Karl Rove and Mike Huckabee, all of whom have endorsed Blunt, as moderates? What does “moderate” mean to Republicans anyway? Corrupt, maybe? Afterthought: It just struck me that the fairy tale format is especially appropriate for the Tea Partiers given their proclivity for fantasy. On June 29th, the St. Louis County Council gave the green light to updated residential building codes that will save homeowners hundreds in energy costs through new energy efficiency standards. St. Louis County is home to approximately one million residents, part of the Greater Metropolitan St. Louis area. The savings are particularly beneficial for Missourians in the long term due to projected coal-generated energy costs rising faster than in other states. The adoption of the new codes means that updated energy efficiency building standards will be in effect everywhere in St. Louis County that is unincorporated or in municipalities that look to the County for code enforcement. St. Louis County is home to over 90 municipalities, many of which enforce their own building codes. There is still work to do among those municipalities that perform their own code enforcement and have yet to adopt the updated energy conservation codes. Although eventually near-zero energy buildings and ultra-low energy homes may be the ultimate sustainable solution, the 2009 International Energy Conservation Code (IECC) establishes a set of minimum energy efficiency standards that will save homeowners on average between 12-15% energy usage. The City of St. Louis is not within St. Louis County, so this code adoption does not affect the city. There is, however, hope that the City of St. Louis will follow the lead of St. Louis County soon, as well as St. Charles County, which lies to the West of St. Louis County. St. Charles County has a population of approximately 350,000, and is one of the fastest growing counties in the country, which makes the adoption of energy efficient building codes extremely important. Ultimately, “sustainability” means behaving in such a way as to preserve and protect the existing ecosystem for future generations to enjoy-leaving things just how you’ve found them. Energy Efficiency is the fastest and cheapest way to reduce greenhouse gas emissions and promote a cleaner and more sustainable environment. National groups like the Sierra Club, US Green Building Council and local ones, the Missouri Association of Accredited Energy Professionals (MAAEP) and the Home Builders Association of St. Louis and Eastern Missouri all support the new codes. Through the adoption of the 2009 Energy Conservation Code, energy efficient homes and businesses will make a substantive contribution creating a cleaner environment tomorrow. Randy’s Turner explores the Missouri implications of the Disclose act, which would have mandated disclosure of who pays for political campaign adverting – nothing more, nothing less – hardly, as Republicans claim, a ploy to “restrict freedom.” Turner’s screed is worth reading in its entirety, so read it here or on the Turner Report. Why'd you do it Claire? It’s also important to understand that Andrew Breitbart’s timing of the release of the grossly distorted video of Sherrod, which he admits having had for weeks, may not be entirely random. Congress will soon vote on whether to fund part of a settlement between the USDA and African-American farmers who faced acknowledged discrimination — farmers like Sherrod and her husband used to be. From this perspective, the manufactured controversy might have proven to be an effective ploy – in spite of the fact that Breitbart’s selective editing was quickly discovered. Only a few days after all the noise about Sherrod began, the Senate stripped from the war funding bill the allocation for the Pigford II settlement, which would have directed that $1.25 billion in reparations be paid to black farmers who were openly discriminated against by USDA in the 80s and 90s. I hoped that tonight the Senate could finally right a wrong that has been left unresolved for far too long. … As recent events have reminded us, the fact that justice and fairness were denied to black farmers for so many years continues to have ramifications today. … Republicans should be held accountable for standing in the way of justice for those affected. Reid is right about the injustice, but wrong to lay the blame on solely on Republicans. As usual, many of the hard-core, Democratic “moderates” (self-labeled) in the Senate voted along with the Republicans – a point of shame for us in here in Missouri since our own Claire McCaskill once more showed her contempt for Democratic values by joining the folks on the other side of the aisle, who more and more seem to be her true cohorts. Why, Claire, one is tempted to ask. Does it have anything to do with her absurd deficit posturing (see also here) – which in itself constitutes a potentially harmful little legislative hobby she has taken up in order, one suspects, to appeal to what she seems to believe to be “common-sense” preferences of small town and surburban Missourians. Or perhaps she is really concerned that the racial overtones that often pervade discourse about government spending in Missouri were just too strong in this case – which means that McCaskill will easily be stampeded to the right in order to avoid the fallout from a Republican race-baiting strategy. The one thing we can be sure of is that the answer with McCaskill always seems to be that she goes along in order to try to get along. In other words, she has no respect for her constituents and is running scared of what she considers their general meanness. Which means that we’ll have to work harder to let her know that we are better than she thinks we are before it’s too late. Can the corpse be raised? Call McCaskill and find out. Click here and pledge to call Claire McCaskill and Kit Bond during the next three days, July 27-29, and let them know that inaction or timid half-steps to combat climate change is not acceptable. 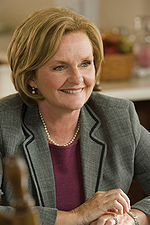 … garnering 60 votes on a plan that caps emissions is a major challenge as long as Democrats such as McCaskill fear the electoral consequences. So you could certainly say without fear of contradiction that Claire McCaskill was instrumental in killing the climate bill. And while she has taken money from coal interests (about $10,000 out of $47,000 total from energy interests), it surely can’t be the case that this relatively tiny mess of pottage is is what prompted her to sell out her base. It is far more likely that she is simply afraid of the the political consequences if she takes a principled stand – afraid that if electricity prices or farm energy prices were to go up, she might be out on her you-know-what come 2012. People in organizations like Repower America know that if we are to revive meaninngful climate change legislation, we need to keep the issue alive and let politicians like McCaskill know that while we’ll get their back when they do the right thing, we won’t forget when they let us down. More importantly, McCaskill is a co-sponsor of the Rockefeller bill that seeks to neuter the EPA’s emissions control rules. And, although, President Obama is poised to veto the bill if it passes, we have to let her know that supporting the coal industry in this way is not really winning hearts and minds at home. In early days, before McCaskill learned to fear the Tea Party backlash, she was, as Michael Bersin reminded us last week, pretty upfront about her support for cap-and-trade. Such past statements suggest that McCaskill knows what the right thing to do is, but is just too timid to do it.That’s why Repower America is asking progressives, environmentalists, and anyone who is concerned about the pending climate disaster, to phone McCaskill tomorrow and remind her of what she already knows. So by all means get mad. But also take action – click here and make a pledge that sometime during the next three days – July 27- July 29 – you’ll phone McCaskill – and poor, hopeless Kit Bond, for what it’s worth – and let them know that we demand real leadership to get us through this potentially disastrous environmental crisis. Afterthought: You don’t even have to click and use the Repower America tools – just phone the fools and let them know the folks they work for aren’t too pleased. Please. McCaskill’s number: (202) 224-6154; Kit Bond’s: (202) 224-5721. I’m typing this waiting for the final evening session. The final speaker will be Al Franken. Today, both Pelosi and Reid spoke. For me, the day was Elizabeth Warren day. If you heard her speak you can understand why she MUST be the head of the new consumer agency the Wall Street Reform Bill sets up. The final session is beginning. More after the fold. Pelosi had clearly had the easier task in addressing the Netroots. 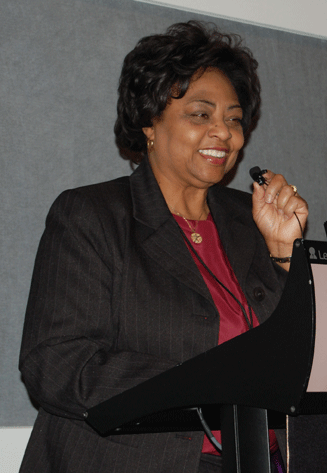 She can talk about the legislation that the House passes that goes to languish in the Senate. Reid had the more difficult task. He defused it when he talked about ending Don’t Ask Don’t Tell. Dan Choi is here and the moderator gave Reid Choi’s West Point ring. Reid said he will return it when DADT is finally ended. They both embraced and it was very touching moment. For me, the best line was when Reid said they are proposing changes in the Senate rules for the next session. That got a big applause. Of course, there were no specifics. I’m going back to the last session. I will write one more summary tomorrow. I hope you enjoyed these reports. Thanks for reading them. Mary Nichols, a Democrat running against Byron DeLear for state rep in the 79th, has lost any shred of respect I might have had for her. Get a load of part of the mailer she just sent out. 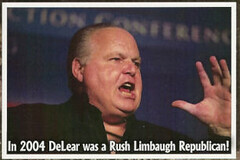 Under the headline “AN ELEPHANT NEVER FORGETS”, she claims that DeLear “forgot” to mention that he used to be a Rush Limbaugh Republican. (That’s elephant hide you’re seeing underneath the text.) Remember that this mailer is going out to Democrats before the primary in a district that will almost surely go Democratic in the fall. I used to be a conservative right wing republican listening to all of those right wing radio talk show hosts, and subscribed to a Rush Limbaugh-esque ideology that’s all about the law of the jungle. You know, the Capitalistic ‘survival of the fittest’. Well I have come through my wicked ways, and I have seen the revelation that building the future of humanity on a foundation of greed and industrial schemes designed to prey upon the weak is simply not sustainable. Being born into a wealthy family and having gone to military school as a little boy were the pertinent ingredients that led to my march in lockstep. 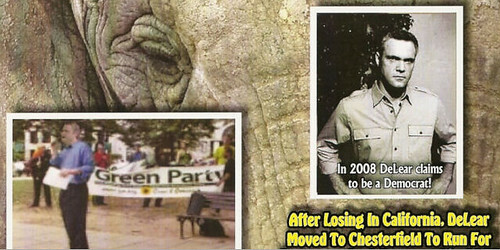 Next the mailer accuses DeLear of having run for Congress in California under the Green Party banner–the implication being that he doesn’t know what he is. Could be that the blurry photo, by the way, was the only one available, but it makes him look like part of a suspicious, maybe faintly subversive group. And now, he “claims” to be a Democrat. Give me a Green guy who got PACE passed in Missouri any day over a real estate agent who wants to develop the Missouri river floodplain. 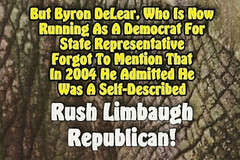 Nichols’ mailer is–speaking of the GOP–a Karl Rove type smear tactic against another Democrat. Look, I understand that any serious run for state rep is hard. Those candidates put themselves through the mill. So when I wrote about that race less than two weeks ago, I gave Nichols every benefit of the doubt, although I thought she had little to offer. Now, I’ll be blunt. She has no agenda to speak of other than trashing a fellow Democrat who has proven that he wants to help the people of this state.